Some people share a PC with multiple users, and each user has it’s own mess of files. They also have separate Recycle Bin’s. When a user deletes a lot of stuff, it sits in the Recycle Bin until it is emptied. Some users don’t know that you need to empty the bin occasionally. Here is a quick command line tip to empty all the Recycle Bin’s on your PC – without having to log into the other users accounts. This could also be scripted if you want to have the Recycle Bin emptied when logging in or off, if you wish. 1. 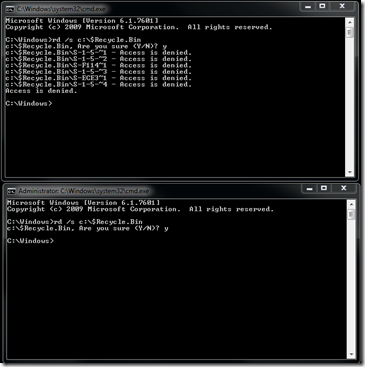 Launch the Command Prompt as an Administrator. Start > All Programs > Accessories > Command Prompt (you can press Right Shift and left click the shortcut and select Run as different user, if needed). 2. Type in rd /s c:$Recycle.Bin and select Y to delete all the files in the Recycle Bin. 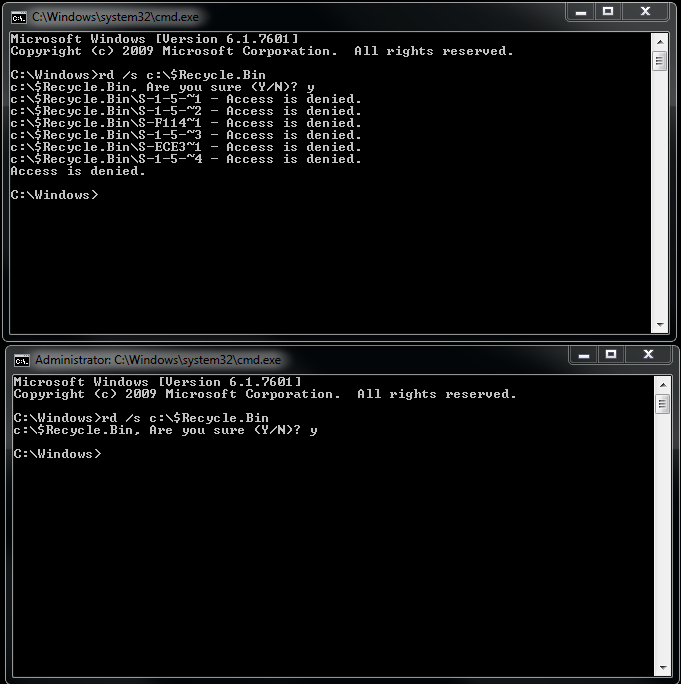 The first window is not using an elevated CMD prompt, the second is using Run as different user as Administrator. This can help you keep your PC clean and stop your hard drive from filling up completely if you have a user that forgets to empty the Recycle Bin! Next post: Nokia Sold 1M WP7 Devices–More to Come? you should detail what each part of the syntax means.